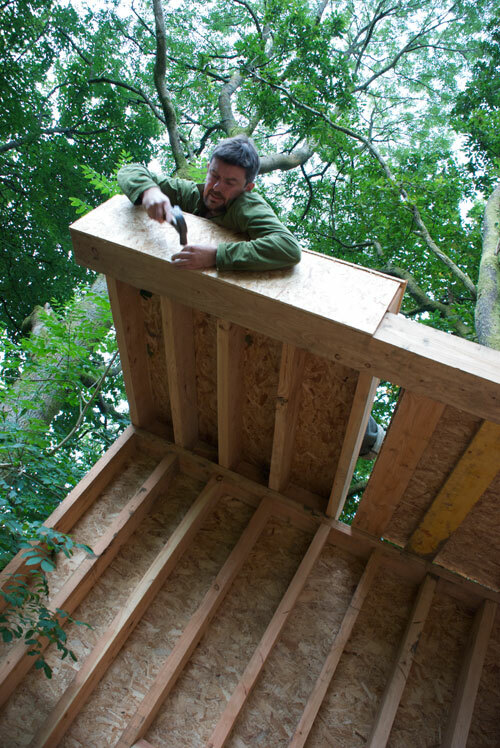 Building an innovative contemporary home in a housing recession, in the English Lake District – a conservative National Park where traditional architecture dominates – was not an easy project! 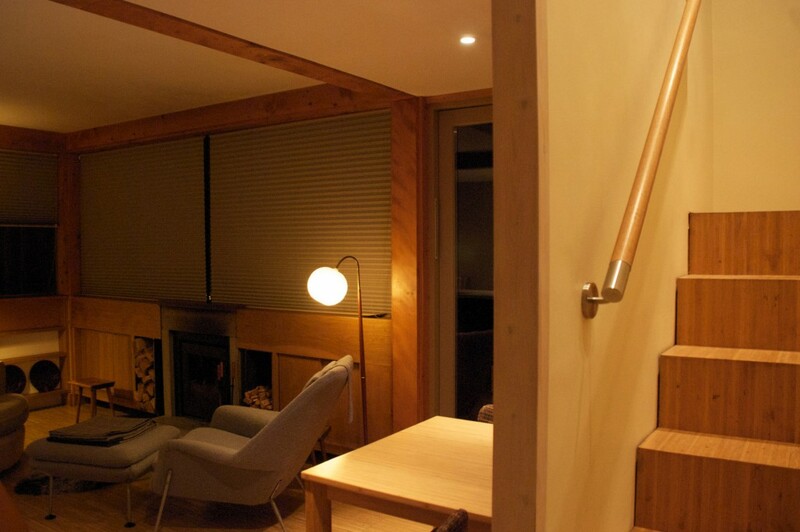 The house was designed by acclaimed Edinburgh-based Sutherland Hussey Architects. Planning restrictions in the Lake District National Park necessitated the small footprint of the house, although it is considerably larger than its predeccessor (called simply Argent Close) on the site, occupying a site on three levels instead of one. After we found the property in 2003 in the local paper, we visited and realised that the site offered unparalleled seclusion and tranquility, with views of Lake Windermere as well as private woodland, and more intimate ‘Zen’ views of moss and rocks closer to the house. The building needed to frame these views in all weathers, and to offer a sense of spaciousness and grandeur despite its very modest size. Choosing an architect was not difficult – Charlie Sutherland being Adam’s brother! Sutherland Hussey have designed iconic buildings in both rural and urban settings – from an entire city in China to a tiny ferry shelter on the Scottish island of Tiree. 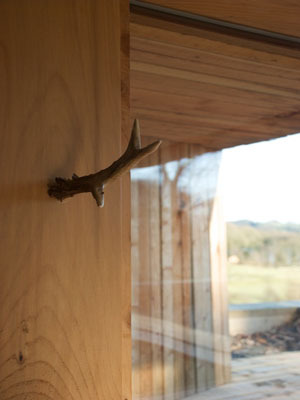 The house is compact and very well-insulated, clad with local timber grown and processed on the neighbouring Graythwaite Estate, meaning an extremely small carbon footprint from source to use. This timber is also used in outdoor landscaping. Interior timber is mainly reclaimed local cedar. 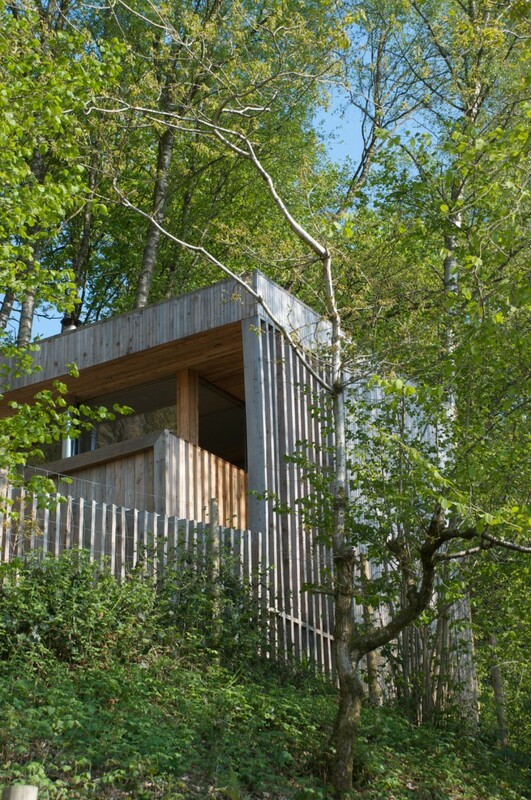 The house stands on innovative ‘mini-piles’, small-diameter (100mm!) steel rods driven into the ground without impacting on the site’s tree roots, protected since 2005 by a Tree Preservation Order. The main house structure uses the SIPs (structural insulated panels) system of wood-clad heavily-insulated boards that can be quickly assembled and have unparallelled insulation qualities. The windows are south-facing and the main heating is provided by a woodburning stove, and the flat roof is left to become colonised with moss, ferns and grasses. Heavy site work and some interior carpentry was done by local farmer Gareth McCartney, whilst other construction work on site was done by local builders (but, reader, we had to sack them all except for the wonderful Andrew Johnson & colleague Mark who saved the day) and ourselves. Interior decorating was very skilfully done by Gareth Beacock. A Blackpool shop-keeping family, the Flowers, purchased the Love Shack’s plot in 1965 and built a tiny log cabin there for family holidays. The surviving visitor’s book from this time (which we still use at the Shack!) reports idyllic walks in the countryside, bird-spotting and pub lunches for £1. 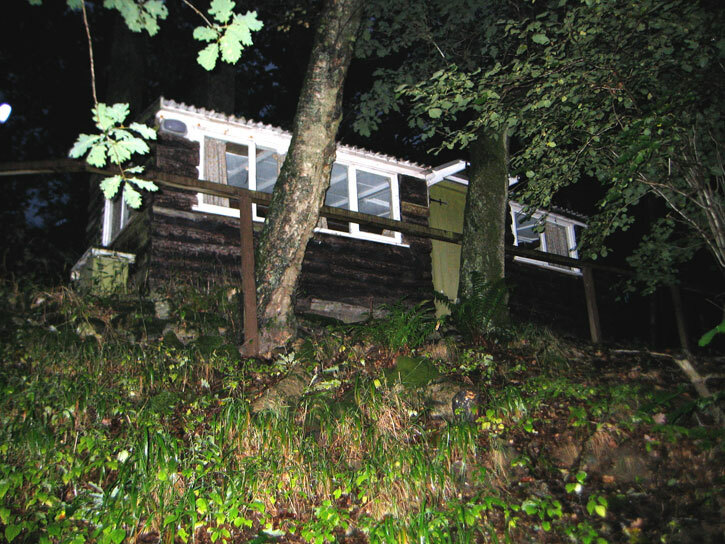 The Flowers’ cabin (pictured above) was basic but characterful, and its 1960’s interior was intact when we bought the property in 2003. By this time it had been some years since the family’s last visits and the cabin’s structure was very decayed. Film-maker Steven Sheil even used the cabin as a set for a horror film in 2006! At the time of our purchase, Argent Close did not have planning permission or even official dwelling status. Despite this, we saw the potential to create a uniquely modern rural home that would help promote sustainable modern architecture locally. We were crazily idealistic! The whole process was (perhaps predictably) arduous and costly, and even included a failed Planning Inspectorate Appeal for which – incredibly – a public hearing in Hawkshead was held (you’ll be glad to know you’re Council Tax is being so sensibly spent). 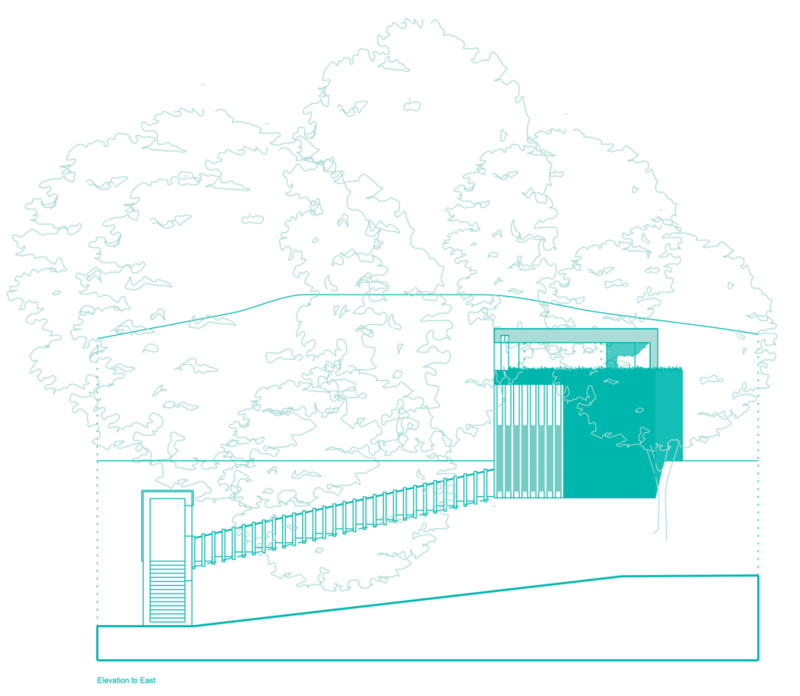 A Tree Preservation Order was suddenly placed on the site as planning permission was being sought, vastly complicating development on the site (which was of course, the point of it for the Planners). But the unequivocal contemporary design of the submitted plans proved to be suprisingly acceptable to the Inspectorate, who commented that only the drainage plans for the site were in need of modification. Following their improvement, and a meticulous method statement regarding construction techniques (e.g. no mechanised equipment allowed on site), the LDNPA (reluctantly?!) passed the re-admitted plans and finally – 5 years on – we could start. We held a well-attended public open day at the site for Architecture Week and received much support from sympathetically-minded local people with an interest in self-building and contemporary architecture. 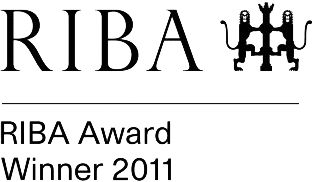 Finally the project began in late 2007, with construction on site throughout 2008 and early 2009. Like all building projects, the adventure had its ups and downs, but in the end a beautiful and unique house emerged from its chrysalis. If you’re interested to know more about the whole endeavour, have any comments, or have a building project you’d like to share with us, feel free to contact us – we are always interested in encouraging new architecture – to show by example was one of our biggest motivations to build the Shack – and we will help however we can.